Instructor User Guide AccessibilityHow can I make tables more accessible? Users of screen readers cannot read tables the same way sighted users do. Sighted users can tell at a glance what column and row a given cell is associated with, but a screen reader user needs a properly coded table. To make tables usable, additional steps will need to be taken to make them accessible. The image above displays a simple table: books read by 2 people. Only column headers are needed to identify who read which books. In the image above, there is a complex table: books read by 2 people each week. Both column and row headers are needed. 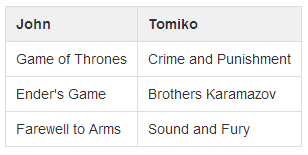 In the second example, a screen reader user will know that The Sound and the Fury was the book read by Tomiko on Week 3. When adding tables, add a row and/or column to be used as a heading for each as appropriate. 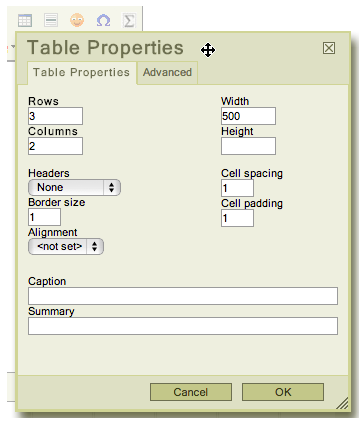 The table creation menu contains Headers options that allow for selecting the first row, column or both. Add a Summary of the table that will inform readers of the table's content. Good examples are: "Data from recent study," "Table of inputs and outputs," etc. Prev: How can I make images more accessible? Next: How can I make videos and audio files more accessible?